Make sure you use 2c. cereal crushed, not 2c. of crushed cereal! I lowered the oven temp. to 325 deg. and that was perfect. Next time I will cut back on the amount of sugar. These were so easy to make and so good! The only change I made was to bake for only 9 minutes. 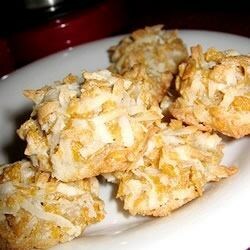 What a great way to use the last of the corn flakes in the box! Thanks, Kathie! My mother made these when I was a child and they are indeed the original and delicious. ***** <---- Extra Stars for this VERY EASY and YUMMY recipe. Thanks Kathie for submitting for others to enjoy. Everytime I have made these, they are a hit with people at work, and my family. The last time I made was at Christmas 2008 and my mom just loves these cookies. I used Corn Chex since we are a gluten free family. I also used 3 egg whites instead of two. They were super yummy! These were really good, I like that they didn't spread out much while cooking. I also liked the light texture to these for something different.